You are seeing the first ever beetroot to appear at our weekly market. The seeds were given to a local lady by a keen expat gardener, and we are reaping the rewards in our lunch. 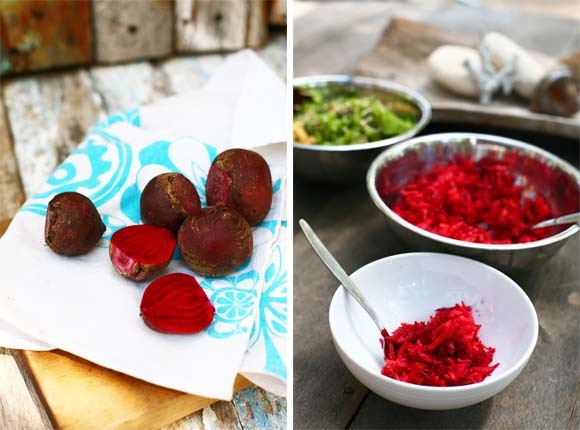 I made a simple salad with grated beetroot and carrot, lemon juice and cumin seeds. I would normally add juicy raisins, but alas the cupboard is bare and the closest shop stocking such exotic imports is a day's travel away. Swell has picked up and there are double over head sets pushing through. For those of you far more interested in barrels than beetroot, I will hopefully have some action shots to share in the next couple of days. That is providing Aquaman and his mates put on a decent show. I don't shoot kooks.